Tuesday was a relatively peaceful day in Douglas. 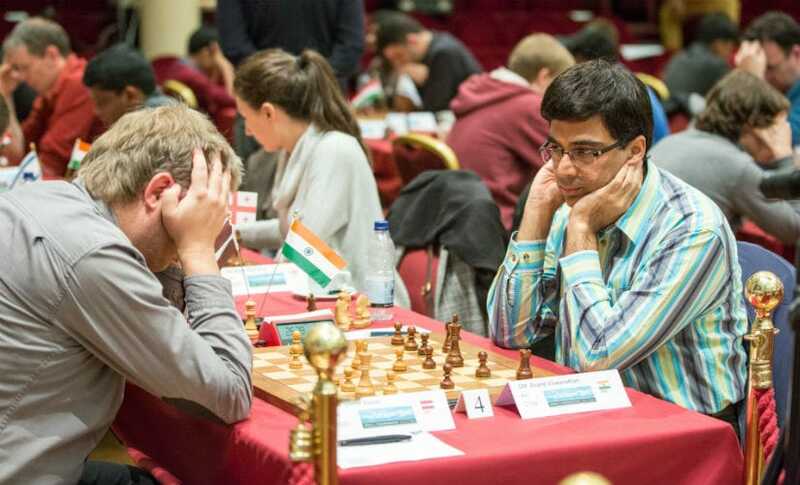 Only two of the top ten games at the Isle of Man Chess Open ended decisively, and both of these games featured an Indian player. 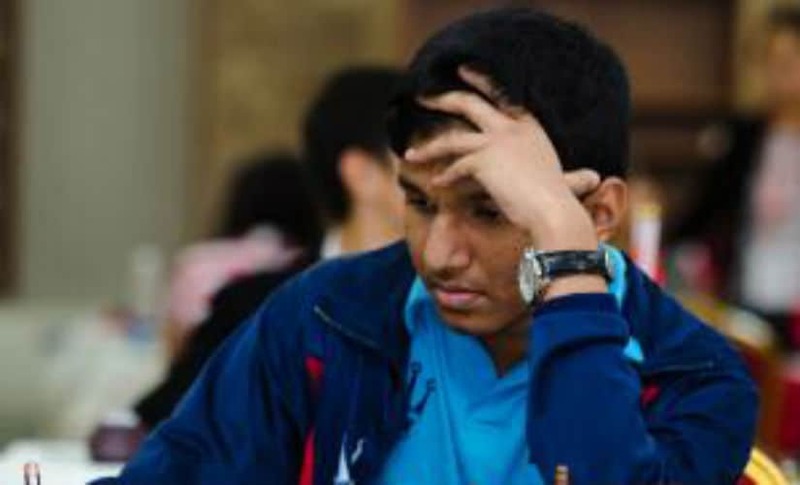 After his first round draw, Vidit Gujrathi had come back strongly, winning both his games in the next two rounds. The fourth round on Tuesday was his chance of scoring a hat-trick of wins. And the lad from Nashik did not disappoint. Playing from the black side of a Ruy Lopez Flohr-Zaitsev variation against Benjamin Bok, Gujrathi played solidly in the opening to secure equality first. Once that was accomplished, the 22-year-old sacrificed a pawn with the idea of generating an attack on white’s king with his pawns. Bok tried to undermine Gujrathi’s pawn chain immediately with 28. g4. But this turned out to be an error on several fronts: it compromised white’s king position and allowed the Indian to plant his knight deep into the white camp. Most importantly, it opened up the g-file which Gujrathi was later able to use to strengthen his attack. This cost Gujrathi another pawn, but at that point, his position mattered more than material. Continuing energetically, the Indian grandmaster kept creating threats in the position and, in the end, walked out of these deep woods of variations with an extra piece. Gujrathi additionally forced an exchange of queens. Being a piece down in a not-so-complex position, meaning that it was an insurmountable task for Bok to save the game. At this point, Bok decided to cut his agony short and throw in the towel. 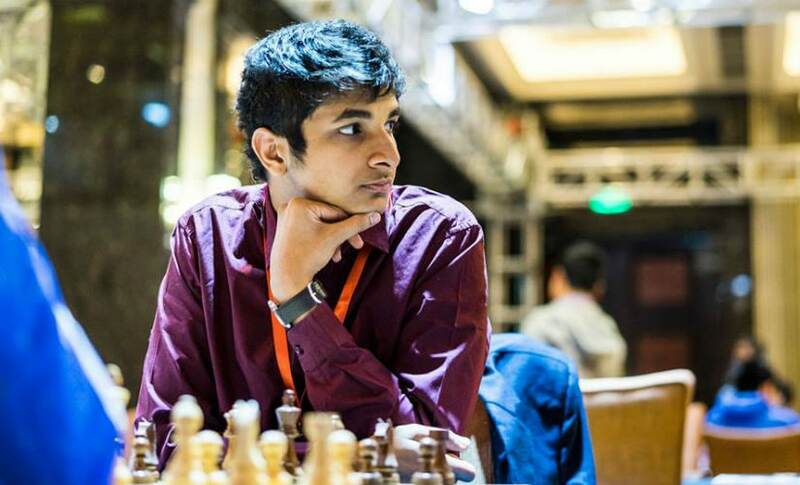 With this win, Gujrathi has joined the world champion Magnus Carlsen and five other players in a seven-way tie for the first place. In Round 5, he will be playing the American grandmaster Alexander Lendermann. 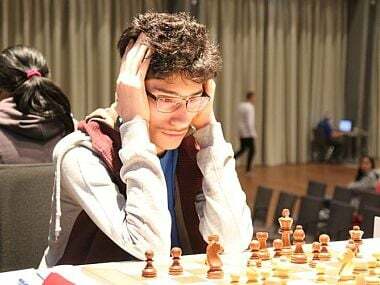 While Gujrathi is the favourite by virtue of his rating in this matchup, Lendermann has beaten a GM as strong as Francisco Vallejo Pons and drawn against Pavel Eljanov in this round. This will definitely be a game to watch out for. 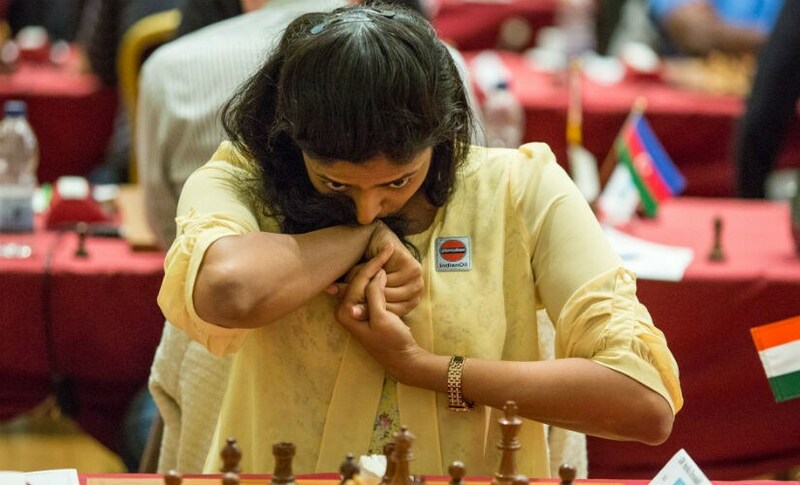 In the other decisive game of the day, the clash between Laurent Fressinet and Harika Dronavalli on board 10 ended with a loss for the Indian women’s number two-ranked player. 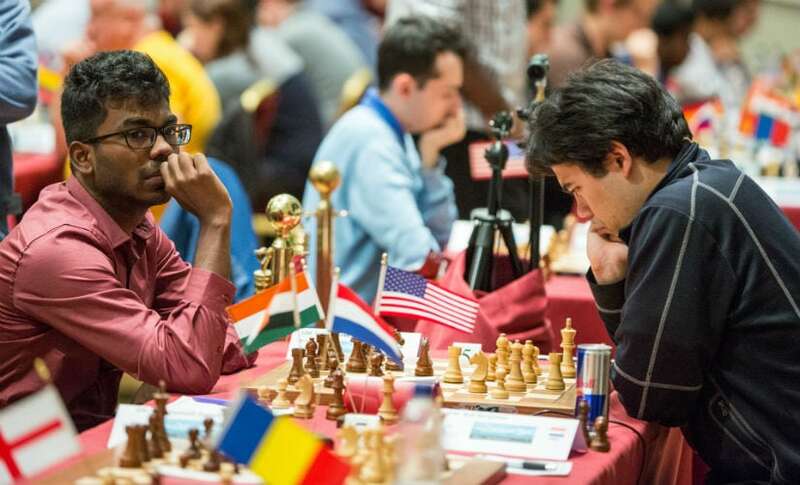 At kick-off, players ventured into the waters of the English Opening with Harika having the black pieces. Right out of the opening, between moves 18 to 25, occurred a mass exchange of pieces that transposed the game into an equal-looking endgame. The Frenchman did have a small advantage because of Harika’s isolated pawn on the queen’s file. As the endgame arose, Harika’s weak pawns began falling off one by one. 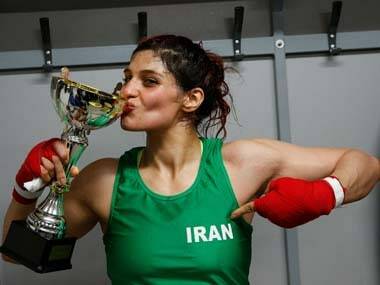 But it wasn’t until the 76th move that Harika gave up the ship. Viswanathan Anand seemed to be in the mood to play safe on Tuesday. Paired against Alexei Shirov, a player known for his creativity and aggressive play, Vishy chose the dullest of openings one could think of: the main line of the Berlin Defence. Nothing much happened in the game. As per the opening theory of the Berlin, queens were exchanged quite early in the game. This was followed by some more exchanges. By the 30th move, players reached a dead equal endgame in which they decided to sign the truce. A win in Round 3 pushed SP Sethuraman high up the pairing chart. On Tuesday evening, he was pitted against the world No 10, Hikaru Nakamura. With the whites in hand and a lower-rated opponent across the table, the American number three naturally wanted to convert the game into a full point. He chose the Cambridge Springs variation of the Queen’s Gambit Declined as his opening weapon for the round. The American number three offered a pawn as early as move 8 with the hope of restricting the mobility of black’s dark-squared bishop, which in turn kept black’s rook confined. But Sethu was not having any of it. He returned the pawn on a timely moment and was successful in inducing his opponent into exchanging queens. A pair of minor pieces and another pair of rooks were hacked off the board soon afterwards. By the 30th move, it looked like players were going to shake hands and sign peace soon. But Nakamura had other plans. Even if there was a whisker of a chance to play for a win, Nakamura wanted to have it. He kept pressing for a long time and, on the 70th move, even won a pawn. However, even with the extra pawn, it was impossible to break black’s blockade. After testing Sethuraman until the 94th move, Nakamura decided it was time to take the draw and call it a day. White had a small space advantage out of the opening, but that wasn’t anything special. 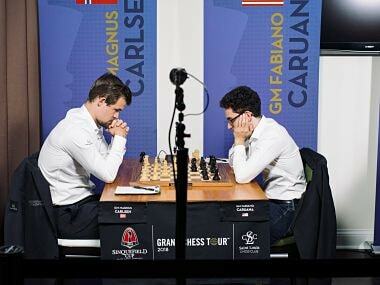 Carlsen tried opening up the position and broke in the centre. But this only led to further liquidation. By the 45th move, the players were in a rook-and-pawn endgame where Carlsen had a slight, but stable, advantage, just the kind of positions the current world champion likes. 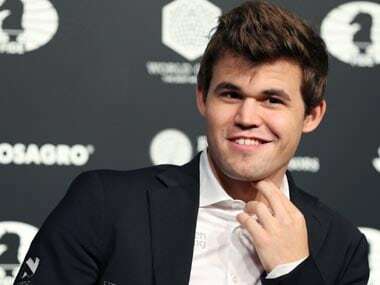 It wasn’t unreasonable to assume that Carlsen might grill Kasimdzhanov for hours to check if he cracks. But things went a lot faster. The two agreed on a draw by the 72nd move. The Indian National Junior Champion, Harsha Bharathakoti, is also in top form in Douglas. So far he has pulled off an amazing show scoring an unbeaten 3.0/4 with a rating performance of 2843 so far. The lad is only 17 years old and has beaten GMs rated more than 250 points above him. 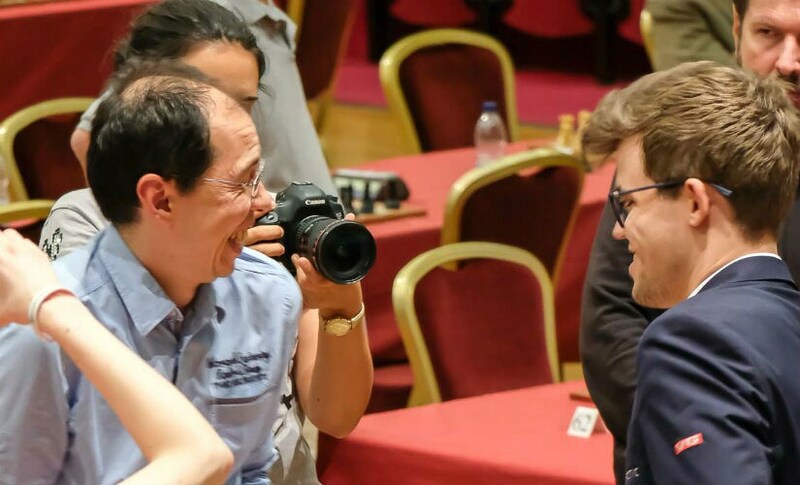 If he is able continue this brilliant show, he might just end up among the prize takers here in the Isle of Man; not to mention, a Grandmaster norm is on the cards by the end of the event!